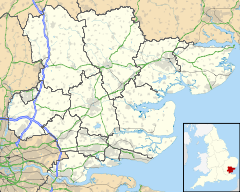 Theydon Garnon is a village and civil parish in the Epping Forest District, in the county of Essex, England. The parish also includes the hamlet of Hobbs Cross. Also recorded as Thoydon Garnon and Coopersale, "Theydon" is thought to mean 'valley where thatch (material) grows' and "Garnon" derives from the Gernon family. A weekly market and annual fair was granted to Theydon Garnon in 1305. A workhouse operated in the parish from around 1704. By 1851 the parish's population had reached 1,237. Epping station opened within the parish in 1865, but was included in the newly formed Epping Urban District in 1896, along with the village of Coopersale and the hamlets of Coopersale Street, and Fiddler's Hamlet. The reduction in the parish's size led to a reduction in population, down to 317 in 1901. The village contains an Anglican parish church, dating back to the 13th Century and dedicated to All Saints. A primary school part-bears the village's name, but is located in the village of Coopersale in the neighbouring Epping parish. Theydon Garnon is very near the M25/M11 interchange, but there is no access to either motorway. The parish has no railway station, the nearest is Theydon Bois tube station. Nearby settlements include the town of Epping, the large village of Theydon Bois, the small village of Theydon Mount and the hamlets of Hobbs Cross and Fiddlers Hamlet. Wikimedia Commons has media related to Theydon Garnon. ^ "History of Theydon Garnon, in Epping Forest and Essex | Map and description". www.visionofbritain.org.uk. Retrieved 2018-01-04. ^ "Theydon Bois: Introduction". British History Online. Retrieved 4 January 2018. ^ a b c d "Theydon Garnon: Introduction | British History Online". www.british-history.ac.uk. Retrieved 2018-01-03. ^ Higginbotham, Peter. "The Workhouse in Epping, Essex". www.workhouses.org.uk. Retrieved 2018-01-04. ^ "Epping: Economic history and local government | British History Online". www.british-history.ac.uk. Retrieved 2018-01-04. ^ "Theydon Garnon: Church | British History Online". www.british-history.ac.uk. Retrieved 2018-01-04. ^ "Coopersale and Theydon Garnon Church of England Voluntary Controlled Primary School - Borehamwood Times". www.borehamwoodtimes.co.uk. Retrieved 2018-01-04. This page was last edited on 13 December 2018, at 03:21 (UTC).